A dream held by many was put into practice in 2013 as the Kiwi Coast got underway thanks to the support of Reconnecting Northland. 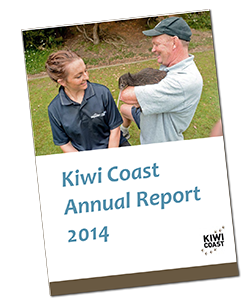 The Kiwi Coast Annual Report 2014 provides information on the achievements and successes of the initiative’s first year of implementation. In line with the Kiwi Coast Project Plan, priority was given to reducing kiwi predators within the first focus area between Bream Head and Whananaki South. This involved the deployment of new traps, more time spent on trap servicing and holding events and workshops to advocate for kiwi protection and better dog control. At the end of its first year, 32 community, agency and iwi-led conservation projects became involved in the Kiwi Coast. As groups and projects joined, the project area of the Kiwi Coast expanded. Stretching approximately 175km from Bream Head in Whangarei, to the Hihi peninsula in the Far North, the Kiwi Coast now extends over roughly 270,000ha. Collation of financial data from projects and groups involved, estimated that the total amount of resources that went into the Kiwi Coast area in the 2013/14 financial year was $1,049,309. Assigning a dollar value of $20/hour to unpaid or voluntary labour results in a value of $308,703. This demonstrates the importance that this often unreported resource brings to the Kiwi Coast, and indeed, many New Zealand conservation projects. With such a successful first year of implementation, the challenge ahead is to maintain momentum and strategic direction to ensure the continued wise use of resources that will most benefit Northland brown kiwi, and keeping our sights on becoming New Zealand’s’ first kiwi corridor.